Christmas outfits are the ultimate way to express our seasonal cheer and this edit is all about dressing up through dazzling colours and festive finishes. Whether it's a chintzy-but-amazing jumper for Christmas day or a glittering sequin dress for the office xmas party, Christmas outfits are all about channeling that novel Christmas spirit. Christmas outfits like textured tops speckled with reindeer noses or fleecy pyjamas in a winter wonderland print are simple ways to get into the celebratory mood while unlocking our inner child and spreading some infectious smiles. 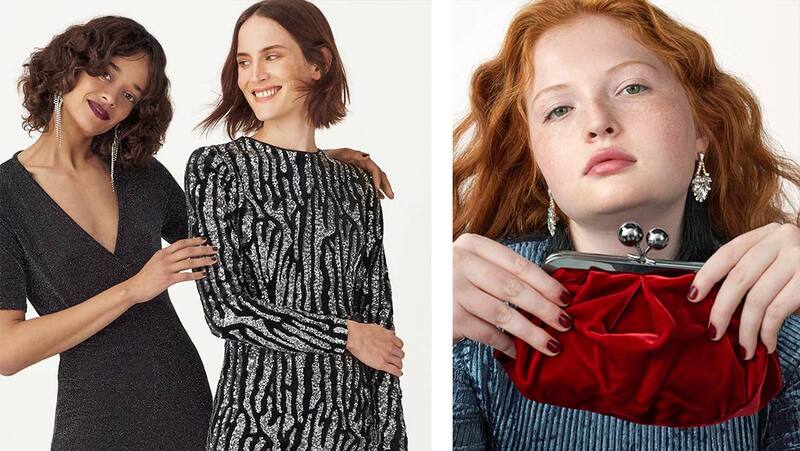 For party-ready Christmas outfits, we love the shimmer of metallic dresses and embellished tops paired with statement heels. Incorporate the whimsical charm of Christmas motifs through mistletoe-themed boxed clutches and snowflake-style jewellery for a subtle way to work the look. Channel so-cheesy-it's-cool Christmas outfit trends with wooly Christmas knits, scarves, mittens and hats featuring fluffy snowballs and decorative bells to carry your festive cheer around with you in the days leading up to the 25th.